In our ongoing effort to make StogieGuys.com as entertaining and reader-friendly as possible, each Friday we’ll post a selection of quick cigar news and stogie-related snippets. We call ‘em Friday Samplers. Enjoy. 1) Cigar Aficionado reports that Eric M. Newman of the J.C. Newman Cigar Company was recently voted the new chairman of the Cigar Association of America. The organization, which apparently lobbies for stogie smokers’ rights, certainly has its work cut out. We’re hoping Mr. Newman can get the industry back on track. 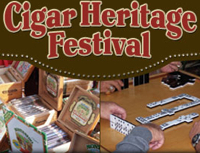 2) If you’re considering a trip to the Tampa area, you might want to arrange your schedule for Nov. 17 to enjoy Ybor City’s ninth annual Cigar Heritage Festival. Admission is free with suggested donations earmarked for the Ybor City Museum Society. The event, from 10 a.m. to 5 p.m., will feature representatives from Fuente, Rocky Patel, Thompson, Camacho, 601, and others. Festivities also include a beer garden, dominoes, entertainment, and cigar rollings. 3) Add a horrifically invasive smoking ban to the list of reasons never to visit Oakland, California. Thanks to a Draconian city council, it is now illegal to smoke in ATM lines, parks, bus stops, and – get this – municipal golf courses. Is this supposed to be a joke? Who do these bans protect? 5) Around the Blogs: Cigar Command has a Padrón 1964. Matt smokes a Fuente Don Carlos No. 4. Velvet Cigar tries a Coronado by La Flor. Brian smokes a Hemingway Classic. Cigar Jack reviews a La Flor Double Ligero. Keepers of the Flame lights up a La Aurora Preferidos. 6) Deal of the Week: If you’re as impressed by Don “Pepin” Garcia’s cigars as we are, then you’ll want to try his latest creation: the Troya Classico XVIII. Tinderbox.com has five-packs for just $29.95 that usually run $45. Grab yours here (and you might also want to check out their eight-Pack Sampler). Great job making this site fantastic. I'm always finding something to read, to agree with, or to disagree with. Keep up the good work.